Andrew Linklater, DVM, DACVECC, practices at Lakeshore Veterinary Specialists in Glendale, Wisconsin, where he oversees the emergency and critical care department and advanced training program. He earned his DVM from Western College of Veterinary Medicine in Saskatoon, Canada, and completed an internship in Los Angeles, California, before pursuing a residency at the Animal Emergency Center in Milwaukee, Wisconsin. Dr. Linklater has authored 2 veterinary textbooks and several publications and has lectured nationally and internationally. His professional interests include trauma, surgical emergencies, mechanical ventilation, and transfusion medicine. 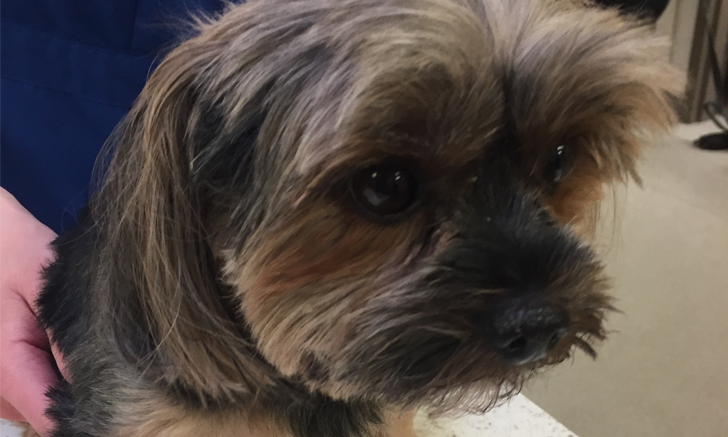 An 8-year-old neutered male Yorkshire terrier is presented for respiratory distress. The patient had been exhibiting a loud, progressive, honking cough for 18 months before presentation. The owners had attempted nebulization and coupage at home without improvement. Physical examination reveals a distressed patient with a respiratory rate of 60 breaths/min, loud upper airway stridor and stertor, and coughing. Temperature is 103.9F (39.9C), heart rate is 160 bpm, and mucous membranes are a muddy/cyanotic color. 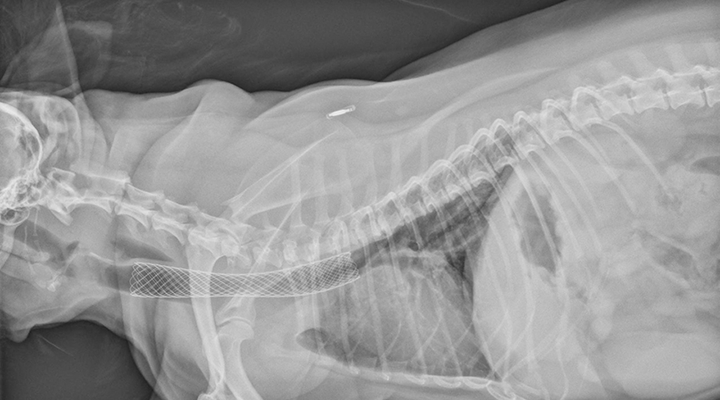 Oxygen is administered, and the patient improves enough for lateral radiography; radiographs reveal a grade III to IV tracheal collapse at the thoracic inlet and a mild interstitial pattern, most prominent in the caudodorsal region of the lungs (Figure 1). Correct ResponseSafePoor mucociliary clearance of commensal organisms can lead to secondary bacterial tracheobronchitis. Patients with tracheal collapse or that have been exposed to groups of dogs (eg, at kennels, parks, daycare, boarding facilities) may have a higher risk for infectious tracheobronchitis (ie, kennel cough [eg, Bordetella bronchiseptica]). 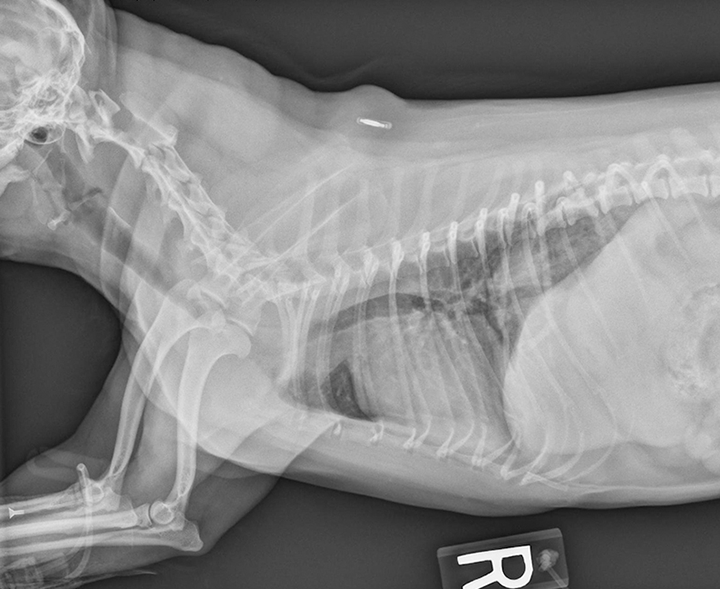 Although simple tracheal bacterial infections can resolve without treatment in many normal dogs, dogs with tracheal collapse may require short-term use of antibiotics. Other first-line antibiotics may include potentiated sulfonamides or azithromycin; amoxicillin–clavulanic acid has variable distribution into bronchial secretions.3,4 Antibiotics ideally should be chosen based on culture and susceptibility results. Correct ResponseDo Not UseDogs with tracheal collapse may require intermittent short courses of antibiotics due to poor mucociliary clearance of commensal organisms. However, cephalosporins generally have insufficient coverage for organisms commonly associated with tracheal infection (eg, B bronchispetica, Mycoplasma spp), and cephalexin does not have sufficient penetration into the airways and bronchial secretions.3-5 Thus, doxycycline or azithromycin may be more effective for these patients. Correct ResponseSafeHydrocodone, a narcotic antitussive agent, is a standard therapy for tracheal collapse used to minimize recurrent episodes of coughing. Decreasing coughing can minimize recurrent tracheal inflammation that occurs with repeated mucosa–mucosa contact. Hydrocodone also provides a level of sedation and mild analgesia necessary for many patients. Correct ResponseCautionAlthough methylxanthine bronchodilators have no effect on the trachea, bronchodilation may be indicated in patients with evidence of concurrent bronchitis. Small airway dilation may decrease airway pressure in the trachea in sufficient amounts to decrease signs of tracheal collapse. In addition, the phosphodiesterase-mediated anti-inflammatory effects associated with theophylline may be helpful.2 However, at high doses, theophylline can cause restlessness, tachyarrhythmias, vomiting, and/or seizures. Excess stimulation may increase the patient’s tidal volume and exacerbate tracheal collapse. In addition, because theophylline inhibits cytochrome P450, it often has clinically significant drug interactions. Correct ResponseSafeButorphanol is an opioid antitussive agent often used as a first-line therapy in patients with tracheal collapse. It can be administered orally for chronic cough suppression or via injection for sedation in an acute crisis. Opioids have been associated with improvement of dyspnea (or the feeling of “air hunger”) in humans6,7 and can relax the patient, thereby decreasing airway pressure and possibly minimizing tracheal collapse. Careful monitoring is recommended when combining butorphanol with other sedatives. Correct ResponseCautionCodeine is a narcotic antitussive that can be used as an alternative to hydrocodone in dogs that require either additional analgesia or additional cough suppression. Caution should be used when prescribing codeine, as many formulations are mixed with acetaminophen. Use of codeine with hydrocodone is not recommended and can cause excessive sedation. Correct ResponseCautionAlthough dextromethorphan is considered a non-narcotic cough suppressant,1,2 it is less effective as compared with hydrocodone or butorphanol. Due in part to the drug’s complex pharmacokinetics, it is uncommonly used to treat tracheal collapse; however, it may be considered in patients with poor response to or experiencing intolerable side effects from other antitussives. Excessive sedation, along with other side effects (eg, hyperexcitability), may occur when dextromethorphan is combined with hydrocodone or codeine. Over-the-counter dextromethorphan may be formulated with other medications (eg, acetaminophen, codeine, pseudoephedrine, doxylamine, diphenhydramine) and thus should be prescribed as a single agent. Correct ResponseCautionAcepromazine, a phenothiazine tranquilizer, is a potent sedative available for either injection or oral administration. Although it can be used in patients with moderate-to-severe upper airway obstruction, such as tracheal collapse, acepromazine should be avoided in dogs with concurrent cardiac disease, as it can decrease cardiac output and lower blood pressure. Patients that are severely affected, are refractory to medical management alone, or have life-threatening airway obstruction often benefit from placement of a self-expanding intraluminal tracheal stent (Figure 2). Most patients improve substantially, and survival rates are high; however, most patients require continued medical management. Weisse C, Berent AC. Tracheal stenting in collapsed trachea. In: Ettinger SJ, Feldman EC, eds. Textbook of Veterinary Internal Medicine. 7th ed. St. Louis, MO: Saunders Elsevier; 2010:1088-1096. Boothe DM. Drugs affecting the respiratory system. In: Boothe DM, ed. Small Animal Clinical Pharmacology Therapeutics. 2nd ed. St. Louis, MO: Elsevier Saunders; 2012:755-759. Boothe DM. Treatment of bacterial infections. In: Boothe DM, ed. Small Animal Clinical Pharmacology Therapeutics. 2nd ed. St. Louis, MO: Elsevier Saunders; 2012:322-323. Boothe DM. Antimicrobial drugs. In: Boothe DM, ed. Small Animal Clinical Pharmacology Therapeutics. 2nd ed. St. Louis, MO: Elsevier Saunders; 2012:197. Lee-Fowler T, Reinero C. Bacterial respiratory infections. In: Greene CE, ed. Infectious Diseases of the Dog and Cat. 4th ed. St. Louis, MO: Elsevier Saunders; 2012:936-950. Takeyasu M, Miyamoto A, Kato D, et al. Continuous intravenous morphine infusion for severe dyspnea in terminally ill interstitial pneumonia patients. Intern Med. 2016;55(7):725-729. Minchom A, Punwani R, Filshie J, et al. A randomised study comparing the effectiveness of acupuncture or morphine versus the combination for the relief of dyspnoea in patients with advanced non-small cell lung cancer and mesothelioma. Eur J Cancer. 2016; 61:102-110. Clarke DL, Culp WTN. Minimally invasive procedures. In: Silverstein DC, Hopper K, eds. Small Animal Critical Care Medicine. 2nd ed. St. Louis, MO: Elsevier; 2015:715-720. Clarke DL. Upper airway disease. In: Silverstein DC, Hopper K, eds. Small Animal Critical Care Medicine. 2nd ed. St. Louis, MO: Elsevier; 2015:92-100. Ettinger SJ. Diseases of the trachea and upper airways. In: Ettinger SJ, Feldman EC, eds. Textbook of Veterinary Internal Medicine; vol 2. 7th ed. St. Louis, MO: Saunders Elsevier; 2010:1073-1078. Scansen BA, Weisse C. Tracheal collapse. In: Bonagura JD, Twedt DC, eds. Kirks Current Veterinary Therapy XV. St. Louis, MO: Elsevier Saunders; 2014:663-666. Weisse C. Intraluminal tracheal stenting. In: Weisse C, Berent A, eds. Veterinary Image-Guided Interventions. Oxford, UK: John Wiley & Sons; 2015:73-90.